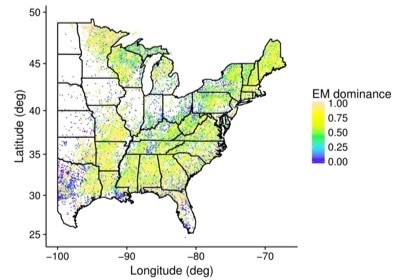 This map shows the distribution of "EM dominant" trees across forest inventory plots in the eastern United States. "Our climate is rapidly changing, and our forests are responding, but in very slow motion—it's hardly detectable," said Zhu, who wanted to identify factors that contribute to the pace of that response. Specifically, soil carbon-to-nitrogen ratios increase with greater ECM dominance—even after accounting for climate, soil texture, and foliar nitrogen. Moreover, ECM dominance is more associated with low soil nitrogen rather than high soil carbon. Functional traits are those that define species in terms of their ecological roles—how they interact with the environment and with other species. As such, they are predictable and easily measured from the ground or by satellite, which makes them particularly valuable to scientists who are monitoring environmental responses to climate change. "They tell us how the ecosystem is responding," said Zhu. 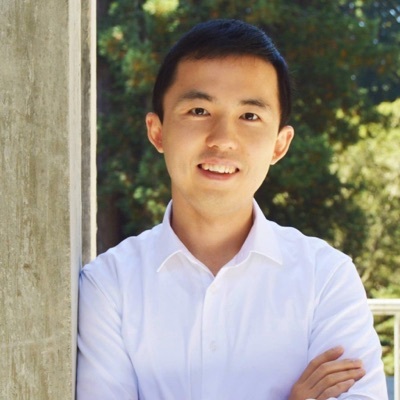 As a quantitative environmental scientist, Zhu brings the tools of statistics and data science to the study of global ecology. Rather than measuring fungal traits in the soil and scaling up, Zhu uses existing data—including large-scale datasets generated by satellites—to look at patterns and processes playing out on continental and global scales. "Big data is becoming more and more popular and powerful," he said. "It's different from traditional research in ecology, which takes place in a lab or in the field." "We know the environment is changing, but how it impacts the Earth and its systems is a big question," he said. "As scientists, we have the responsibility to correctly work out this problem—it's a problem that's important to scientists and the general public."